An artist from the city of Leipzig, he was well known as part of the German Little Masters; painters of small prints. In 1523 he traveled to Nuremberg and studied in Albrecht Dürer’s (1471 – 1528) studio and later studied the Venetian artists of Italy. In Italy it is likely that he studied under the engraver Marcantonio Raimondi (1480 – 1534), who had made copies of Dürer’s woodcuts. After his formation as an artist, Pencz was imprisoned and banished, for his association to the “Godless painters”, who denounced their belief in baptism, Christ and other religious ideas such as transubstantiation (bread and wine into the body and blood of Christ). He was led to these beliefs through the radical teachings of the German reformist Thomas Münzter (1489 – 1525). The brothers and painters, Barthel Beham (1502 – 1540) and Hans Sebald Beham (1500 – 1550), were among the other “Godless painters”, and also taught by Albrecht Dürer, who was very much an artist of religious works. Fleeing to Italy, Pencz and the brothers were soon pardoned and allowed back to the Nuremberg, all regaining a reputation as the Little Masters. Pencz gained prominence in this area with his engravings of, Six Triumphs of Petrarch and the Life of Christ, which includes 26 plates. Pencz also became an official painter for the city of Nuremberg, executing large ceiling canvases and gained much respect for his portrait work. Just before his death, Pencz was appointed the court painter for Albert, Duke of Prussia (1490 – 1568), but past on before completing any work. 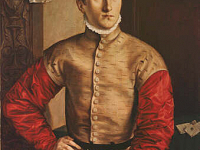 Of his important portraits are Portrait of a Seated Youth, or Portrait of a Young Man, from 1544 and now in the Uffizi Gallery. 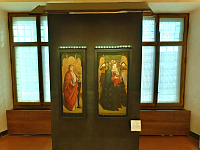 There is also his, Portrait of Marshal Schrimer and Portrait of Erhard Schwetzer and his Wife, Portrait of Count Palatine Ottheinrich, among others.